Collection of seven episodes from the children's animated series based on the Russian folk tale. The programme follows the unlikely friendship of an adventurous little girl named Masha (voice of Elsie Fisher) and a woodland bear. 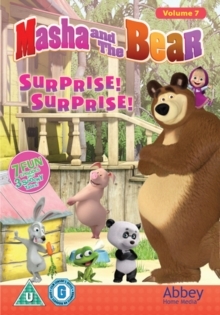 The pair meet after the bear gives up his job as a performer in the circus and hopes to settle down to a peaceful life in the woods, only to be disturbed by Masha and tag along on her adventures. The episodes are: 'At Your Service', 'Rock-a-Bye, Baby! ', 'Surprise! Surprise! ', 'The Three Mashkateers', 'We Come in Peace', 'Tea for Three' and 'Best Medicine'.